The village of Büyükkonuk, (formerly Komi Kebir), in North Cyprus is located in the lowland foothills of the Beşparmak mountain range on the far east of the island. It’s situated about 6km north-east of Boğaz, just before the start of the Karpaz Peninsula region. It is also a village of some note due to it recently being designated as an area for eco-tourism, and has subsequently even been filmed by foreign film crews for international culture programmes. It is accessible from taking the very scenic coastal road past Esentepe and onto the partially finished new road which will take you to Kaplıca. You will then venture on to older roads turning right inland signposted for Büyükkonuk and Sazlıköy. Alternatively you can take the inland Geçitkale road to Iskele and Boğaz, turning left at the costal junction, following the coastal road for a few miles until you reach turnings for Tuzluca and Büyükkonuk. The village of Büyükkonuk and its surrounding area is beautiful, and with efforts being made by its villagers to create a life of self-sustainability, it is fast becoming a great place to visit to see a unique insight into traditional Turkish Cypriot culture. 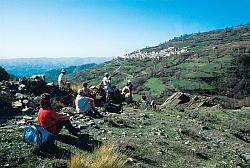 Today it is mainly an agricultural village, growing crops such as olive, carob, wheat and barley along with vegetables. Livestock also forms part of the local population’s livelihood with dairy cows, sheep and goats providing milk and meat. The community is being helped in its efforts by the Economic Development and Growth for Enterprises (EDGE) under the Cyprus Partnership for Economic Growth (CyPEG) project, and funded by the US Agency for International Development (USAID) and the Turkish Embassy. This funding has enabled various restoration projects to get underway, such as restoring the town square and church, and it has helped with initiatives to educate the local community on the importance of their heritage and environment. The local municipality also has a committee dedicated to the involvement of its eco-tourism status and has received help with training its members from the William Davison Institute in Michigan. 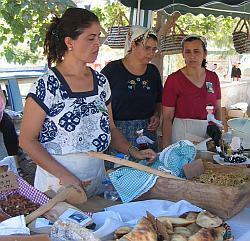 Part of a visit to Büyükkonuk should be to see the traditional arts and crafts being made by the local village women, and Eco-Tourism festivals in April and October time have been held to enable visitors to see, taste and buy some of the local produce available. So far these festivals have been a great success, and two were held in 2008 with demonstrations from villagers in the art of basket weaving for example, as well as macaroni and mud brick making! Folk dancing displays and donkey rides were also part of the fun! 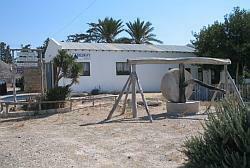 You can also visit the restored olive mill factory which has been turned into a functioning museum, with its equipment and explanations of the operation as well as its history, and within its grounds there are also some very interesting species of flora that have been grown to give visitors an idea of what can be found in the surrounding areas. Büyükkonuk also has various trail walks around the local countryside where you can take in the views whilst watching for migrating birds, and perhaps have a picnic. Kantara Castle, one of the famous Crusader castles, is also located to the west of Büyükkonuk, a short car journey away. In Büyükkonuk you can also find Delcraft, a company set up by Turkish Cypriot Ismail Cemal and his Canadian born wife Lois. 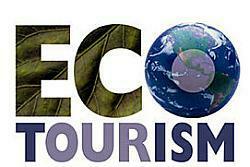 This company is dedicated to eco-tourism efforts, providing information, accommodation and holidays for the eco-tourism hungry visitor, and it also has its own craft shop. You can learn more about Delcraft by clicking on this related article. I would like accommodation in this village – 2 single rooms – for night of April 27? Could you please advise?